Videos, solutions, and lessons to help Grade 4 students learn to interpret a multiplication equation as a comparison, e.g., interpret 35 = 5 × 7 as a statement that 35 is 5 times as many as 7 and 7 times as many as 5. Represent verbal statements of multiplicative comparisons as multiplication equations. I can explain how a multiple equation can be interpreted as a comparison such as Jason is 4 times as old as Ben. I can write an equation for a situation involving multiplicative comparison. 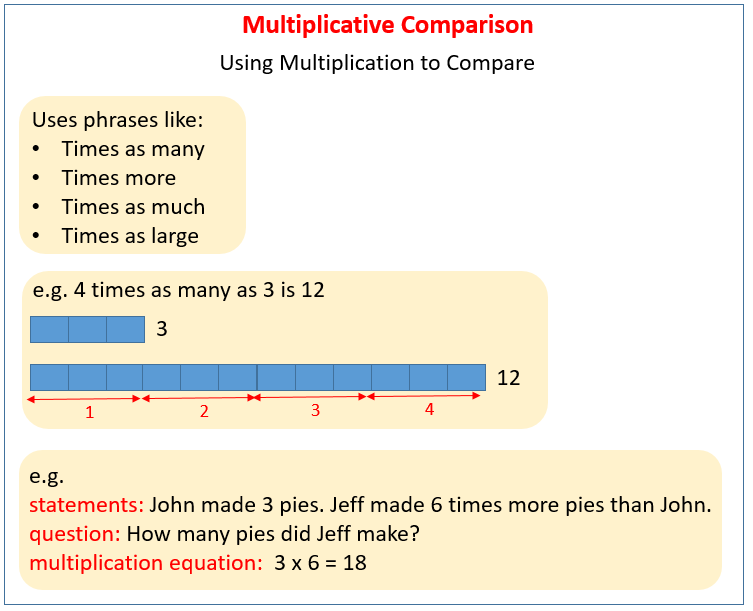 The following diagrams give examples of Multiplicative Comparison: Phrases used, Model Diagram, Multiplication Equation for a Word Problem. Scroll down the page for more examples and solutions. How to use models, illustrations and writing to solve multiplicative comparison questions? 1. Multiplicative comparison means you are comparing two things together that need to be multiplied. 3. We use the two statements to determine the number sentence or equation. 4. An equation is just like a number sentence but it includes letters. 1) Darlene picked 7 apples. Juan picked 4 times as many as Darlene. How many apples did Juan pick? 2) Joelle read 9 books in the fall. George read 7 times as many books. How many books did George read? 3) Sarah is 12 years old. George is g years old. Sarah is 3 times as old as George. How old is George? 2. An equation is just like a number sentence but it includes letters. 3. The letter is called a variable. 1) Suzie is 4 feet tall. There is a tree in her yard that is 9 times taller than she is. How tall is the tree in Suzie's yard? 2) The tree in Suzie's yard is 36 feet tall. The tree is 9 times as tall as Suzie. How tall is Suzie? 3) Suzie is 4 feet tall. The tree in her yard is 36 feet tall. How much taller is the tree than Suzie? Multiplicative comparison problems compare a characteristic of two objects using multiplication. Sometimes we know the value of the object that is bigger/older/faster, sometime we know the value of the object that is smaller/younger/slower and sometimes we know how many times bigger/older/faster one object is over the other? Use a variable for the value you don't know and fill in the rest of the equation. 1. Mrs. K is five times as old as her son. If she is 35, how old is her son? 2. Mrs. L has two dogs. Scruffy is 12 inches high at the shoulder and Tuffy is 24 inches high at the shoulders. How much bigger than Scruffy is Tuffy? Write a multiplication equation to match each comparison statement. 21 days is 3 times longer than 7 days. 8 pounds is 4 times as heavy as 2 pounds. 72 inches is 12 times the length of 6 inches. 30 fish is 5 times as many as 6 fish. Write a comparison statement to match the multiplication equation. Hannah was doing a report on animals’ sleep habits. She made the charts below to show the number of hours certain animals usually sleep each day. Fill in the blanks to make the statements true. A possum sleeps ______ times as many hours a day as a guinea pig. A bat sleeps ______ times as many hours per day as a cow. When Hannah was reading about donkeys, she said, “I can’t believe that goats sleep 5 times as many hours per day as donkeys.” Find the number of hours per day a donkey sleeps. Show your thinking below using words, numbers, and/or pictures. A donkey sleeps _______ hours per day. Last weekend, Cassidy, Jefferson, and Braden played three basketball games against their cousins, Sammy, Kara, and Mitchell. The chart below shows how many baskets each were able to make during their three games. Fill in each blank with a player’s name or a number to make each comparison statement true. Below each comparison statement, write a multiplication equation to show that the statement is true. statement: ________________ made three times as many baskets as Sammy. statement: Cassidy made ______ times as many baskets as Mitchell. statement: Jefferson made _____ times as many baskets as _______________. statement: Sammy made double the number of baskets _____________ made.